The Baptistery of the Cathedral of Pisa is a building next to the Cathedral. It is the largest Baptistery in the world. You can visit the white 12th century building from the outside for free and from the inside for an entrance fee. The round building has a diameter of about 33 meters and is about 54 meters high. The circumference of the largest baptistery on earth is about 104 meters. In the past, children could not be baptized in the cathedral itself or in any other church. The reason for this was that under no circumstances could unbaptized children enter a church, not even for their own baptism. Thus the baptism had to take place outside the church. In order to give the baptism a worthy setting, chapels were built in which people were baptized. Baptism in Latin means „baptizare“, in Italian „battezzare“, in English „to baptize“, and so on. Hence the name Baptistery. 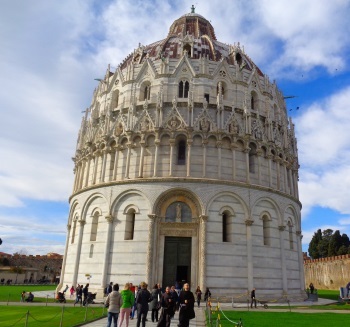 What do you see in the Baptistery of Pisa? In the lower area is the beautiful baptismal font of Guido Bigareli da Como from the 13th century. Only since 1929 in the Baptistery of the Cathedral there is a statue representing John the Baptist. You should also have a look at the beautiful marble pulpit.But the highlight for many visitors is the walk to the upper gallery. You can go up a staircase, we counted 69 steps. At the top you can walk around the round building. One has a nice view outside and down into the baptistery. From a window you can take a good picture of the cathedral, which is approximately 30 metres away. The other windows, however, are provided with a rather narrow wire grid. Thus, photos in other directions from the upper floor are unfortunately only possible to a limited extent. Important: Only a limited number of visitors may visit the Leaning Tower. Tickets are often booked out days or weeks in advance: On this good English language website you can buy your tickets in advance on the internet. During our visit in early 2019, the Baptistery was open daily from 9 am to 6 pm. Between the Leaning Tower and the Baptistery is the Cathedral itself. The Leaning Tower of Pisa cannot be seen from the upper balcony of the Baptistery. One should behave like in a church and wear appropriate clothing. The bapisterium has a very unusual and well-known acoustics. See also: Baptistery Cathedral Florence, also well known with the famous golden doors..